Healing kits are specially prepared equipment for the purpose of general medical treatment in the field, usually in the shape of a well bound leather container or satchel. Such a kit usually contains several ounces of different types of medicine, herbs and other such natural non-magical resources that can disinfect wounds, halt the effects of poisons and diseases and effectively alleviate pain and injury. Healing kits come in a variety ranging from +1 to +10, each of which adding the corresponding number to the result of any Heal check made while using the item. A healing kit is specially prepared before hand, and its contents are effectively depleted after one usage. The kit can be used for a multitude of different health oriented purposes. Lastly, a healing kit may be used even if the user has no active ranks in the Heal skill, but such a person can only use the kit to attempt and heal non-magical injuries and effects. To use a healing kit, the user makes a Heal check with his current modifiers and adds the bonus contained within the kit. The result of the skill check determines the scope and effectiveness of the healing attempt. When not threatened, a person may take 20 on a Heal check with a healing kit. A person may also use a healing kit to give himself medical treatment at no penalty to the check, as long as the severity of his own condition doesn't prevent him from doing such. Healing Wounds: With a healing kit, you can heal wounds without the help of magics that you might not possess. The base DC for normal medical treatment of injuries is 0, and the amount of hit points recovered by the target of the healing is equal to the result of your check. In special cases, the healing of wounds is made more difficult by the supernatural effects embedded within certain injuries, like a horned devil's infernal wound ability. In cases such as this, a Heal check may be made against the DC of the offending creature's ability to try and end its effect. Only a person with at least one active rank in Heal may use a healing kit to this effect. Remove Nausea: Any effect that makes a creature nauseated or sickened can be removed with a healing kit at a DC equal to 10 or the DC of the sickening or nauseating effect, whichever is higher. If this effect is magical, only a person with at least one active rank in Heal can remove it. Detoxification: You can use a healing kit to eradicate poisons from a person's body. This requires a Heal check at a DC of 15 or the DC of the poison, whichever is higher. 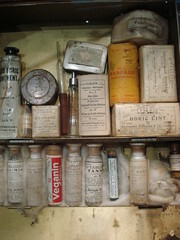 Treating Disease: You can use a healing kit to purge a person's body from diseases. This requires a Heal check at a DC of 15 or the DC of the disease, whichever is higher. To heal magical diseases, the associated Heal DC increases by a further +10. Likewise, this can only be done by a person with at least one active rank in Heal.